UC Santa Cruz graduate Gillian Goslinga has been honored with the 2006 Sardar Patel Award for "the best dissertation submitted at any American university on the subject of modern India." The award of $10,000 is administered each year by the UCLA Center for India and South Asia. Eligible dissertations must be completed at an American university and fall within the humanities, arts, or social sciences. 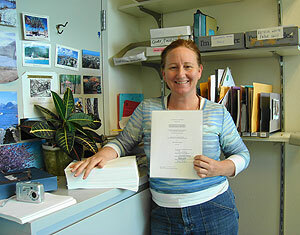 Goslinga received her Ph.D. from UCSC's history of consciousness program in 2006. Her research on gender, reproductive technologies, and "traditional" god-assisted reproduction or virgin birth beliefs in contemporary Tamil Nadu, South India, explores the intersections of religion, science, and modernity in the lives of women. Goslinga's award-winning dissertation is titled "The Ethnography of a South Indian God: Virgin Birth, Spirit Possession and the Prose of the Modern World." UCSC history of consciousness professor James Clifford described it as "a genre-bending work of experimental/theoretical ethnography, based on quite extraordinary fieldwork in South India." Goslinga said she would gift a portion of the award to her fieldwork assistant this summer when she returns to India to finish a film that she began there during her dissertation research. Goslinga is currently in post-production on The Pujari's Daughter, an intimate chronicle of the life and work of the big priestess (periya pujari) of the Hindu temple that is the principal site of her research in South India. Goslinga previously directed and produced a film about gestational surrogacy in the U.S. titled The Child The Stork Brought Home (1997). She currently teaches at San Francisco State University in anthropology and as a lecturer in feminist studies at UC Santa Cruz.